By Adam Justice / IBTimes.co.uk / February 9, 2015 / The head of the International Atomic Energy Agency (IAEA) team that will review Japan’s decommissioning work at Fukushima Daiichi nuclear power plant this week, said on Monday (9 February) that contaminated water leakage remains a challenging issue. Since the devastating March 2011 earthquake that caused triple meltdowns at the Fukushima plant, operator Tokyo Electric Power Co (TEPCO) has struggled with the initial crisis and subsequent unprecedented work needed to decommission the facility. The company floundered in dealing with several problems at the site, including a series of leaks of radioactive water into the Pacific Ocean. TEPCO proceeded with decommissioning steps, including the tricky removal of spent fuel rod assemblies from a badly damaged reactor building. Dismantling the plant and decontaminating the nearby area is likely to take decades and cost ten of billions of dollars. In January, TEPCO said it would not be able to meet a self-imposed deadline to decontaminate water containing highly radioactive substances by the end of March. Thanks for poisoning the world! Greed backfired on us all! The disaster was, as you may already know, due to a natural disaster that was much worse than was anticipated, and many people have died, and are suffering in the region. Unlike Chernobyl where, as you said, it was the head scientists’ greed for promotion and status that led to careless construction of the facility and haphazard deviation from the manual, The Fukushima plant had security measures that met standards. Likewise, if for instance, a hurricane of unprecedented size was to hit south Carolina and cause leaks from the Virgil C plant, one cannot blame anyone since the best was done to make it safe. On the other hand, the Vermont Yankee plant’s leak of radioactive tritium into ground water supplies was caused by pipe deterioration, an oversight that is hard to justify. The Three Mile Island disaster was worse in that it was due to inadequate training and interface issues such as hidden indicator lights that led to false assumptions regarding the situation. The question then is: how well the problem was dealt with; Mr. Yoshida for example took media fire, political bashing and finally died of cancer to save the world from a worse disaster. Myself, I certainly do not have the guts and altruism to go through what he went through. Thus, before commenting rashly, in an accusative judgmental way, please try to consider the whole situation. Although it was only one line for you, it hurt me much more than you could have imagined. If you have taken the time to read my whole comment, thank you very much for doing so. If not, I understand since I am sure you must be busy, and have other matters to attend to. Thank you for continuing to report the Fukushima news. Fukushima has been under control by the government and the media. I’m not good at English, sorry. 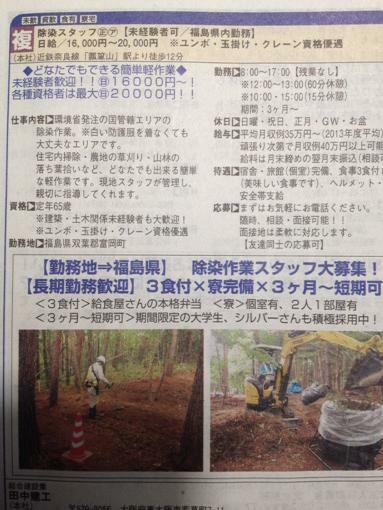 This is a recent domestic news of Fukushima. I want you to know what the government and companies are doing to workers and people of Fukushima hiding in the shadow. I did not know it is possible to decontaminate radioactive water. Better to say filter some particle and dump the rest of the water into the dead pacific. They can not seal the leak, can not pile the water tanks up. So no choice. They will run out of human resources and money. Robots can not deal with the high radiation (they fry) And the development of the robots are very expensive as well. This is just a show for people. One for sure I do not buy car from Chernobyl and Japan. I do not want to breath in even one piece of crap. *PUKE* You people make me sick! You should be ashamed of yourselves and I hope you reap what you sow. You’re childrens children will hate you. For Tony Rabbit, the idiot Prime Minister who dismantled Australia’s entire alternate energy industry immediately after gaining office to even consider a nuclear future in a country blessed with endless sunshine, proves beyond doubt that his attitude to the planet and all that is on it includes him on the long list of world leaders totally unsuited for their positions. When will we learn. Keep it in the ground.